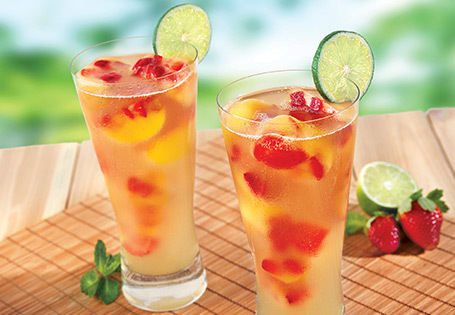 Fruit-flavored ice cubes add flavor to your green tea as they melt. Boil 8 cups water. Pour into a clear pitcher. Add 6-8 green tea bags and steep for 3-5 minutes or to desired strength. Remove tea bags and refrigerate. Place strawberries in a food processor and pulse gently until roughly chopped. In a pourable container, combine strawberries, orange juice and lime zest. Pour into ice cube trays. Freeze for 2 hours or until set. To serve, fill glasses with ice cubes and top with chilled green tea. Garnish with lime slices.